← Ivy Tech Community College enters into statewide agreement with Dell Inc.
LAFAYETTE – Two dozen high school students will attend Summer Middle Technical College on the Ivy Tech Community College campus thanks to the Indiana WIRED grant the college received in October 2007. The grant will cover the students’ cost of tuition, lab fees, and books, while the students attend one or two advanced manufacturing courses during a three week period in July. The courses offered are ADMF 101 Key Principles of Advanced Manufacturing and ADMF 102 Technology in Advanced Manufacturing. The courses introduce various manufacturing processes and basic practices of safety and quality control. Students learn through online simulation and programming in addition to lectures and labs. Each course meets for four hours each weekday from July 7—27. One course meets in the morning and one course meets in the afternoon and students can enroll in both courses at the same time. 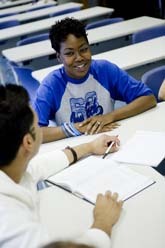 Students are enrolled in Ivy Tech., and can earn up to six college credits. Upon successful completion of the course, the students will be prepared to take the certified production technician exam administered by the Manufacturing Skills Standards Council (MSSC). This certification can be applied to the requirements for a core-40 technical honors high school diploma. High school students who will be juniors and seniors in the fall can enroll by contacting Rosemary Cheek at 269-5240, or rcheek4@ivytech.edu. Ivy Tech received a $3.178 million grant from Indiana WIRED, a 14-county partnership of educators, workforce and economic development officials and other leaders working to rebuild the region’s economy. The grant will establish New Pathways to STEM-based Careers, a program that encourages and enhances science, technology, engineering and math (STEM) training and education. Ivy Tech delivers professional, technical, transfer and lifelong education that prepares Indiana residents to learn, live and work in a diverse and globally competitive environment. Ivy Tech offers affordable, open access education and training programs that enhance the development of Indiana’s citizens and communities and strengthens its economy. The college is accredited by the Higher Learning Commission of the North Central Association of Colleges and Schools. More information is available at http://www.laf.ivytech.edu.